LIC DSE Study Materials | Books for LIC Direct Sales Executives written test Exam and Interview in Hindi List of best reference books on LIC Direct Sales Executives exam 2014. 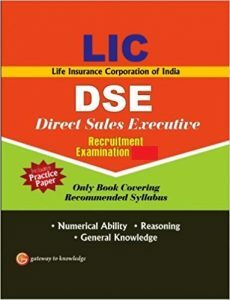 The book “LIC DSE – Direct Sales Executive – Exam” is an ultimate work for the DSE exam based on the latest pattern announced by the Life Insurance Corporation of India. The book contains concise theory for the 4 sections – Reasoning, Numerical Ability, General Knowledge (Current Affairs) and Sales Aptitude. The book provides carefully selected MCQ exercises for practice. The solutions to all the exercises are provided at the end of each chapter. The book provides one Mock Test (fully solved) on the pattern of past years question papers. A special section on “Sales Aptitude” is provided in the book. It has been divided into 6 chapters. Latest Business Awareness has also been included as a chapter. The book provides latest Current Affairs section so as to keep the students updated. This book shall be a Real Cracker for the LIC DSE exam.